Jon Wertjes, Minneapolis director of traffic and parking, has encountered yet another form of transportation that could cause traffic and pedestrian problems–or help solve downtown parking problems. Electric scooters have recently appeared on Minneapolis streets. St. Paul has asked the company that provides the scooters to remove them until the city can create a framework for how or if they can be used on city streets. San Francisco issued a cease and desist order to the company that provides them, while Austin and Washington, D.C., are hurrying to adopt regulations governing their use. One of the issues I regularly faced when I was president of the International Downtown Association was that our members were almost always barraged with complaints about the lack of centrally located employee parking. Some downtowns developed peripheral garages and lots with shuttle buses; but often, this was less than satisfactory because of long waits for shuttles to circulate. Plus, shuttles are expensive to operate and are subject to traffic jams in downtowns. But what if an employee could park in a remote facility and grab a scooter as soon as he or she parked their car? The scooter could be dropped off in close proximity to the office where the employee worked and the problem of long waits and circuitous shuttle bus routes would be solved. Some might argue that this solution would only work in fair weather, but I’ve seen bike riders in New York and Minneapolis riding when there is snow and ice on the roads. 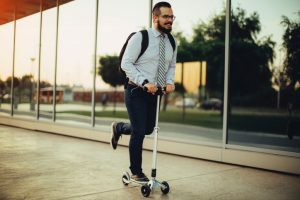 If scooters could make peripheral lots an inexpensive and practical alternative to shuttle lots, it could make the lives of downtown employees and downtown organization managers a lot easier.